Award-winning horror film producers and directors, Chad Archibald and Cody Calahan of Black Fawn Films have released The Wicker Man-looking poster for their latest chiller The Heretics and have announced that they’ve renewed their commitment with one of the leading Canadian production and distribution studios, Breakthrough Entertainment. The deal comes after co-producing eight successful horror genre feature films that have garnered numerous accolades at film festivals internationally as well as theatrical releases in the U.S. The extension of the partnership will feature a commitment to increased budgets and a more aggressive casting strategy. These new films will build on the unique and elevated concepts with which Black Fawn has built their reputation. Titles that have been co-produced include Antisocial (1 & 2), The Drownsman, The Sublet, Bed of the Dead, Let Her Out, and Bite, which was theatrically released in the U.S. Since the inception of the multi-picture deal, Black Fawn Films has become an integral player in the horror genre on a global scale. The Heretics, Black Fawn’s eighth film in the series of productions with Breakthrough, will have an early introduction to buyers with a market screening during the 2017 European Film Market (EFM) on February 14th in Berlin, prior to the film’s international festival run. Black Fawn’s next film, I’ll Take Your Dead, currently in casting phase, will mark the beginning of Black Fawn’s next steps with Breakthrough, following the market screening of The Heretics. 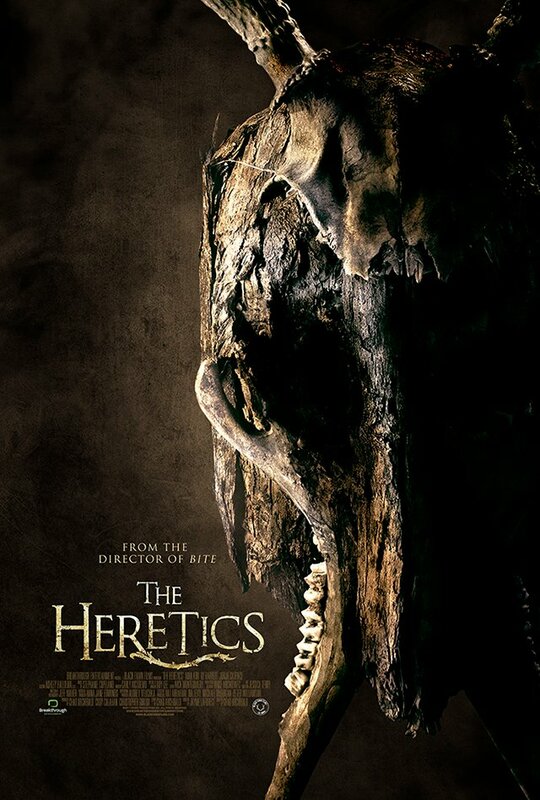 The Heretics features a young girl who is abducted by a man, after he claims that a cult is hunting her. His goal is to protect her until sunrise but while restrained, the young girl falls deathly ill. While her friends and family search for her, the source of her illness becomes more and more apparent. She’s not sick…she’s changing. Have a look at the creepy poster below!